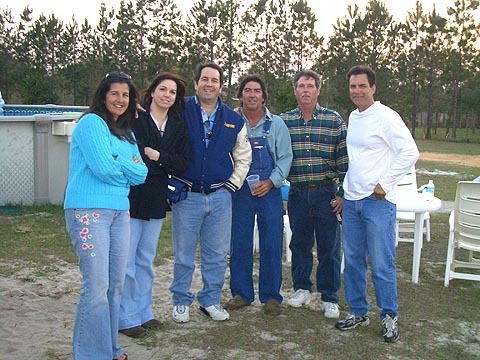 Here in Clermont town Florida, at a South West High School reunion, the quad runners are tearing thru sand and grass as they whiz past a fence of wooden poles and chain link steel. A John Deer tractor sits idly by and watches as wind chimes tinkle in the summer wind. The orange tree citrus grove blossoms profuse this time of year with new season’s wonderful perfumed scent. The proud flag of America is draped in red, white, and blue as it dances quietly on a flagpole to country western music, next to camper trailers and pop up tents. A Ford F-150 truck is driven down the windy road, to where a whole butchered pig is being picked up today. The pig is then brought back by the new age hunters, lightly seasoned and is then loaded into a heavy metal smoker as the smoke drifts into the clear blue wind. I have flown across the country today, for a chance to be with my long lost friends. It is my fate to take this journey, I am better off than the pig. Hodad Pauly and Carmel are still my life long friends. They have offered up their home as Camp Carmel today. They are the concrete that holds us all together in this forever-changing world that we all live in that keeps trying to keep us apart. I notice that inside their wooden barn holds years of boxed up photographs and memories just waiting to be picked through. Happy kids come blasting thru the barn doors, just playing tag as I remember it as a young lad. Their golden skin and sun bleached hair is blowing in the wind. There are fishing poles with half-spun line hanging out with metal coca-cola signs. Baseball hats and sunglasses are worn by everyone today in the blazing Florida sun. The family dog is fenced in, but is feverish for attention today. The pigskin football and beat up Frisbees are pulled out and tossed around for fun, while my old friend Mikey B. lights off skyrockets aimed at the sun. The over stimulated coca-cola kid’s roar on by chasing down the falling parachute skyrockets with tiny legs of speed. 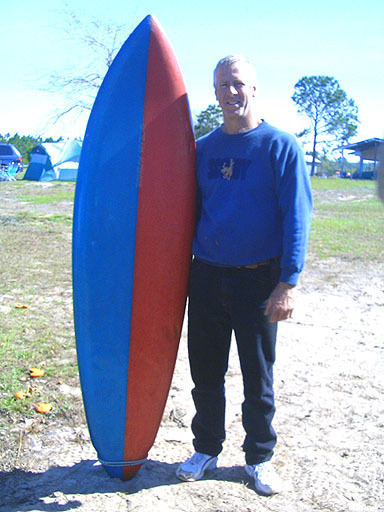 I begin to drift back in time for a brief moment as I notice that Paul still has his old surfboard that he got in high school when we were the Miami Beach surf dogs on the prowl. Wow, he still has it. How cool is that… I guess that keepsakes are hard to get rid of for sure. Veteran Jack and his trusty dog, still idly stands at watch. Surrounded by his wonderland world of open space and tacked on field fence, still unwilling to surrender. Dormant Crepe Myrtle trees silently watch as the world spins round and the cell phones are switched to off. The reunion conversations begin to flow smoothly today, like the way that the great flavors of America’s favorite beers of Budweiser and Miller taste on your tongue on a smoldering day. I have been gone so long I hope they still remember me. It dawns on me early today, that time is seldom your best friend, and often it is your own worst enemy. Miss Laura from the Miami-Vice days and her sidekick girlfriend Karen Rodman are still as tall as ever. Even though they are both way taller than I am, somehow I always looked up to their ability to remain life long friends in this short life that we lead. A loud speaker suddenly goes off in my head when I finally meet everyone that goes… Ladies and gentle men let me introduce to you the starting line up of the Purple Eagles football team. There are big names that still ring a bell like Conlan, Bogaards, Chickillo, Garber, Martone, Pivacco, and starting at quarterback is Jamie Boone. Even “Wink” Gary Price the kamikaze pilot was there. You guys were giants when I was in high school. 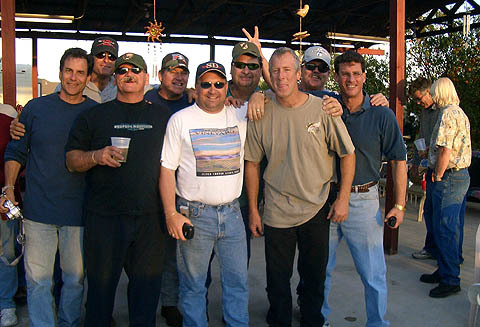 We all still have one thing in common for sure; we all like ice-cold beer, laughing, and sharing stories about the good old days. As the afternoon sun slowly melts into the Gulf of Mexico to the west of here, the citronella tiki-torches are lit all around the place and somebody say’s, “I dare you to jump in the swimming pool”. I do not think that I have had enough yeer bet, or is it beer yet. Now, for Wayne and Leon Edwards the flask brothers, that is a completely different story. The Clermont wind still blows the truth year after year around here as the sunset sky turns into a fiery blackened orange. I look to the right for a moment and notice that the kitchen stirs with too many cooks in it, as the Shorty’s barbeque sauce brought by David Hardeman is welcomed with open arms. You know, Hardeman is one of the funniest guys that I have ever known since our Mugsy’s Hideout days. Some one walks out of the kitchen and offers me a snack called trailer trash that is covered with powdered sugar. It is an unusual selection of snack indeed and I cannot help but bust up laughing at the name. Time marches on in this world, and minute by minute the sky fills with heavenly stars at dusk as Big Tom the former fireman attempts to wrestle the smoked pig out of the red-hot smoker just for fun. 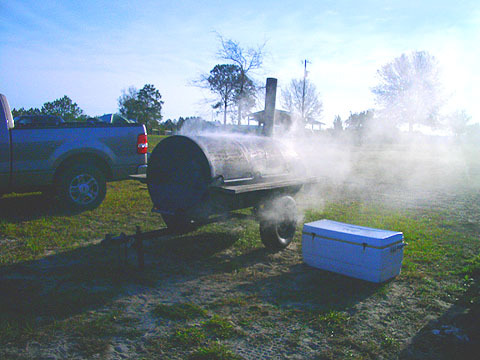 You can almost taste the goodness of the smell of the smoked pig as it wafts thru the air. Gut wrenching laughter from jokes imitates hunger pains, with empty stomachs yearning for fulfillment. My memories of Florida have not been forgotten, now that my friends have disappeared into the winds of change. I guess that this life that I live in California as a writer and artist is how God planned it for me years ago when I moved away. It is a different kind of destiny that was dealt to me, one that I have been blessed with, for sure. Here in Clermont Town, the feast for Kings and Queens is offered to the hungry mob. The wood smoked pig is torn apart and separated easily from flesh and bone. The Shorty’s BBQ sauce is still as good as I remembered it. After a half hour of oohhss… and aahhss….the dishes are all cleared away and cleaned up like the passing rain that cleanses the land. Photographs are taken once again by the paparazzi, freezing precious moments in time. Nighttime Camp Carmel is beginning to be set up, as the evening temperature plummets into the upper 50’s. Fireflies and flying embers soar into the sky as Mother Nature patiently watches and listens. Stacks of oak wood are piled into the fire ring offering evening warmth for everyone around the pit. The bonfire burns hot like molten lava as it reaches high up into the sky tonight. It is an offering to the fire Gods who live up above us in the heavenly skies. We are thankful for the heat and the companionship this evening. Empty bottles, late night playing cards, and classic old stories of our long lost youth bring the evening to a wonderful close. It is a yearly reunion that is good for our forever-searching souls. Even though time keeps ticking off of the melting clocks, we all now have a wonderful rendezvous spot that lets us rediscover our youthfulness thanks to Paul, Carmel, and James. The famous explorer Ponce De Leon frantically searched for the fountain of youth in Florida centuries ago, but he never found it. Perhaps he over looked it in his haste. I am so happy to tell you that it can be found, right here in the sunshine state. Right here, in Clermont Town. Visit my award-winning web site @ HYPERLINK "http://www.gregoart.com"
Shop at my new gift store at HYPERLINK "http://www.cafepress.com/gregoart"